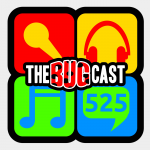 the bugcast 524 – Hot quickie! This week on The Bugcast: Moo has a low iron count, we round-up our trip to Podcrawl Glasgow, and a new-old podcast is launched, and we play you 8 cracking tracks of Creative Commons music! Bug Report Podcast – a new podcast from the people who brought you Linux Voice! The next show will be episode 526, which will be streamed live in the chatroom on Friday 10 August 2018 at 21:30-ish UK time (BST/GDT/UTC+1).